Few days away from the commencement of the 2014 National Association of Government Approved Freight Forwarders (NAGAFF) elections, the NAGAFF Electoral Commission (NECOM) has said that all was set for a free and transparent election that would in turn engender a seamless transition. Speaking to newsmen on the preparedness of the Commission to conduct the election which is scheduled to commence on Monday, 10th March, 2014 with Apapa Chapter, the Chairman of NECOM, Mr. Okey Nereus maintained that the commission was set to give the association the best election that will soon become a reference point for other freight forwarding associations in the industry. “We have an onerous job to give NAGAFF a very credible election and that is what we stand for. Myself and my team, we are people who have a name to protect and then if you have a name to protect, it will make you to work hard and that is why we are giving our best since we came on board”. “It is work, work, work to ensure that we have a seamless transition and the promise we have also made to our members is that after this elections, stories will be told, people will begin to make references to this elections as being the best that of course, other freight forwarding associations can also copy from it”, Nereus said. He disclosed that the registration of members for the purpose of the elections had since ended on the 3rd of this and that all the chapters were to turn in their registers for use to compile the voters’ lists as well as use them for the purpose of screening both the aspirants and the voters with the aim of determining their eligibility. 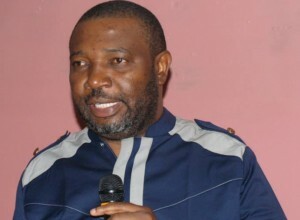 While expressing his satisfaction over the way and manner the aspirants and supporters conducted themselves during the electioneering campaigns, he however hoped that the same feat would be replicated during the elections itself adding that NECOM had put in place, stringent measures towards ensuring a smooth and hitch free elections. He debunked the claims that the notice that evidence of registration with the Council for the Regulation of Freight Forwarding in Nigeria (CRFFN) as a panacea to qualify one to vote or be voted for came rather late as he clarified that registration with CRFFN was made part and parcel of the criteria for qualification either to vote or be voted for even when the Commission briefed the association at its Annual General Meeting (AGM) of the association held at Abeokuta on December 8, 2013 maintaining that three months down the line, it was wrong for anybody to come up with such claims. The NECOM boss called on anyone with substantial evidence that most of the aspirants went out of their way to register non NAGAFF members for the purpose of winning the election to come up with the said evidence as according to him, no such thing happened in the association as NAGAFF has a way of identifying who are its members. Mr. Nereus further denied any knowledge of claims in some quarters that some aspirants from the Tincan Island Chapter went about introducing themselves to the authorities there as the officials of NAGAFF in the chapter saying that to the best of his knowledge, all the caretaker committee members in Tincan Island chapter had turned in their resignation letters in line with the electoral guidelines of the association even as he said that anyone who engaged in such a heinous act was culpable of impersonation and would face the consequences if caught. While faulting the report in some sections of the media that quoted him as trying to prevail on the members of the association at PTML chapter to allow the elections for the chapter to be suspended pending the recovery of their missing chairman who was abducted early this year by kidnappers on his way back to Lagos from the east, Mr. Nereus however clarified that the request came from the chapter members themselves requesting that NECOM suspend the elections in the chapter that it would be morally wrong for them to go on with the elections when their chairman was still missing, a request he said the commission had since turned down. While urging members of NAGAFF to come out en-masse on the scheduled date for each of the chapters to vote in their preferred candidates saying that neither NECOM nor NAGAFF headquarters had adopted nor anointed any candidate for the elections even as he challenged all the aspirants to go out and convince the voters to vote for them as according to him, only candidates that scored the highest lawful votes cast wins the elections.